This Hotel is Currently Trending! Currently rated at 90% compared to its all time rating of 89% and ranking at 2 of 866 hotels (up 115 places from 117) based on reviews in the last 7 days. Nearest: Tube Station: Earls Court 211 yards (192 metres), Railway Station: West Brompton 0.4 miles (0.6 km), Motorway: M4 Junction 1 3.7 miles (6 km). The Hotel Indigo London Kensington is located a relatively quiet side street off of Earls Court Road and is walking distance from Earls Court Exhibition centre and tube station. While the hotel calls itself Kensington this is really to take advantage of the fashionable name. It is indeed walking distance from Kensington but the area its located in is really more accurately described as Earls Court. Earls Court Road has a good selection of small shops and bars. This location is in west London while central London and its many bars, restaurants and shop are just minutes away by taxi or tube train. Nearest attractions include Commonwealth Institute (0.6 miles), Hyde Park (0.7 miles), Kensington Palace (0.8 miles), Albert Memorial (1 mile) and Holland Park Theatre (1 mile). Upmarket shopping and restaurants are nearby along Kensington High Street and the even more chic and classy shops and boutiques of Knightsbridge (home to Harrods department store). Hotel Indigo London Kensington is a former converted terraced Victorian House dating back to 1886. Today its a contemporary cool hotel having been fully refurbished in 2013 at a cost of £7 million pounds.. The hotel bedrooms are all individually designed and reflect the brands boutique ethos. Every guest room has a king sized bed complete with mattress topper and Egyptian cotton linen. They also all feature double glazed windows and individually controlled air-conditioning. The in-room facilities include a flat screen television, desk, direct dial telephone and cordless phone, wireless high speed internet access, safe, mini bar (with complimentary soft drinks), IPod docking station, ironing facilities and windows that can be opened. Some rooms have a balcony. Bathrooms come with a hairdryer, free toiletries, slippers and bath and/or spa style shower. There are 11 junior suites and 22 executive rooms. Mansion Bar & Parlour: Destination bar specialising in molecular and carbonised cocktails. Open for breakfast, brunch, afternoon tea and dinner; extensive range of English wines and fine French champagnes. A refined venue with live jazz. The bar serves some of the finest Champagnes and traditional method sparkling wines. The a la carte menu has been developed to partner the wines. Special menus: Champagne & Oyster Thursdays, Afternoon Tea served Monday to Saturday, Sunday Champagne Jazz Brunch. The bar is themed around an 1890s private members club. The Indigo Hotel Kensington has a dedicated business centre where guests will find facilities for photocopies, courier services, fax and computer hire. Please note the business centre is unstaffed. The hotel has 2 iPads available for guests use. Onsite is a well equipped gymnasium with cardio machines, free weights, Treadmill, bicycle, cross trainer and exercise mat. Other services include luggage storage, same day dry cleaning pickup/laundry and concierge services. Public areas are air-conditioned. The lounge remains open 24 hours as is the front reception. The hotel has an ice machine and 2 iPads available for guests use. The hotel is fully non-smoking. Hotel Indigo London Paddington: is 1.8 miles (2.8 km) away, has a guest satisfaction score of 90% and rates start from about £126. Hotel Indigo 1 Leicester Square: is 2.9 miles (4.7 km) from here, earns a customer rating of 92% and base rates begin at about £127.5. Hotel Indigo London Tower Hill: 5.2 miles (8.3 km), rated at 91% and with rates from around £109. Compared to other London hotels: This hotel has been rated 89% by past guests (however its currently trending higher, see note at the top of the page for its 7 day ranking). The London average is 80% and the average for 4 star hotels is 83%. Therefore this hotel is above average for its sector (star rating) and for London as a whole. Indigo Hotels across the chain average 89% so this hotel is rated as average when compared to other Indigo hotels. Milesfaster ranking: 116th from 866 London hotels, 3rd of 4 Indigo Hotels, and 48th of 328 four star rated hotels. If you are looking for something a bit cheaper then take a look at the Doubletree By Hilton Tower Of London. 0 miles away (0.0 km), has been rated at 89% by past guests and has rates from around £119 (theres free WiFi too). 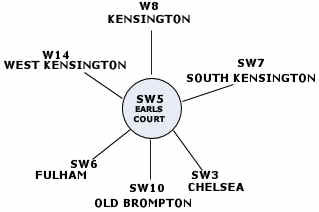 The 51 nearest hotels around this area (34-44 Barkston Gardens, SW5 postcode) which we have have on our website extend out to a 0.5 miles (0.8 km) radius. The numbers by star rating are 2 five star hotels (average rating 88%), 25 four star hotels (average rating 81%), 18 three star hotels (average rating 74%) and 5 two star hotels (average rating 68%). Coming out as the top rated hotel are The Nadler Kensington (4 star) and also the Hotel Xenia (4 star) (both joint top with 90%). Base Rates: We compare area starting room rates by using base rates. Bear in mind we use the published base rates which do not reflect short term offers and deals. They do however give a decent relative comparison. Looking at all hotels in the area the average base rate is £103 per night. They range from a low of £44 at Lord Kensington Hotel (3 Star, 71%) up to £255 at The Bentley London (5 Star, 88%). Rates break down to the following for each star rating: Five Star average: £245, Four Star average: £115, Three Star average: £82 and Two Star average: £62. Using our in-house algorithm we rank hotels based on guest ratings and weighted for related factors. We have a ranking for Hotel Indigo London Kensington 3rd (joint) of 51 and 3rd (joint) for the 25 four star hotels in the area. Our base rate rank for the hotel is 36th of 50 (15th of 25 four star hotels.). We use the base rate ranking and review ranking for the hotel to get an overall ranking of 6th of 47 for sheer value for money (Montana Hotel was top). History: Owned by Cairn Hotel group since 1993. Refurbished 2013 which increased the room capacity from 93 to 100. Was called the Barkston Gardens Hotel until rebranding in 2013.